Our Sister Cecilia Ramisch died at St. Mary’s Hospital on January 21, 2019. We celebrated the Funeral Mass honoring Sister Cecilia on February 1. The Sisters waited for Fr. Mike Joncas to return to the Cities so that he might preside at the Eucharist. Fr. Mike and Sr. Cecilia had a long telephone relationship. Sr. Cecilia was the “fisher of priests” for our daily Eucharist in Bloomington. Clare Sisters and Family members followed. Srs. Caroline and Helen place the pall on the coffin. Sr. Gabriel placed the Form of Life and the Crucifix on the coffin. The evening before the Funeral Mass at the Vesper service for Sister Cecilia we read from Sister Cecilia’s personal reflections that she had left for us which we call, The Gospel according to Cecilia. Who is more delighted, the cats or Sally? Too bad that Kitty had to leave! Eight hundred years ago St Francis of Assisi celebrated Christmas with his friends. They put on a play with a life sized crib and all the accoutrements that an Italian town could offer. Everyone had a part. They were able to see and hear, to speak and sing, to enter into this great and simple mystery, God is with us. When leaving our Monastery in Bloomington last February we left all of our beautiful manger scenes to our Pro Ecclesia Sancta Sisters except for one: a simple crèche made by the Little Sisters of Jesus, pictured here on our Christmas greeting. This was a gift to us from a dear friend who received it as a gift from the Little Sisters. Our donor felt that we would have more opportunity to pray with this beautiful crèche than she. And indeed we have prayed before this crèche. It had been the central focus in our oratory during the Christmas season for over thirty years. But before we could use Sister Caroline’s photo of the crèche we needed to ask permission from the Little Sisters of Jesus. Thanks to the internet we found the home of the Little Sisters in Baltimore, Maryland. Sr. Beth reached Little Sister Rita by phone. A friendship was born and permission was given. The figures of Mary, Joseph and the Christ Child could be from any country of the world and as our little globe becomes smaller through communication and mutual appreciation our prayer becomes more particular and universal. Through the Ages the tradition holds from Bethlehem to Francis, to Charles de Foucauld, to Little Sister Madeline and here with us today through this precious Christmas crèche. Our community of Clares will celebrate for the first time the coming of the Lord here with the Franciscan Sisters of Rochester, Minnesota. And each and all of you will be held in our prayer. The San Damiano Cross from the 12th century to the present. “Keep Your Eyes on Me”: a song written by Sebastian Temple, a secular Franciscan, way back in the 60’s. Outside the walls and down the hill from Assisi is the little chapel of San Damino. It was there, praying before the Crucifix, that the young rascal, Francis, destined to become the world famous saint, was commissioned to transform our world into a place of beauty and love. And this is a replica of the San Damiano cross in our Assisi Heights third floor chapel. It is here that the we Clares gather five times a day to continue that prayer of Francis for God’s beloved people. The flowers are from Brother Bob Frazzati and Friar friends from the East Coast. Every August 11th for the feast of St. Clare of Assisi, we receive, that is, the Clares throughout the world, a letter from the Minister General of the Order of Lesser Brothers, the Franciscan men of our multifaced Franciscan family. Brother Michael Anthony Perry is our current Minister General and Servant. His letters are inspiring and challenging. On the cover of his letter he has a painting on wood by a Spanish Friar, Fra Miguel Angel. It is interesting because Clare, as a mature, fully garbed nun, is kneeling on one knee outside the monastery at night gazing at a crescent moon and stars. This makes me chuckle because I would put Francis in this picture and Clare inside the Chapel gazing at the 12th century San Damiano Cross, the resurrection cross, with Christ’s arms out-stretched to embrace all God’s people. The Story of our Banner from Rochester. When you open to our Blog banner you notice something different. You no longer see the Bloomington Monastery in the seasonal photo with our St. Clare there to greet you. If you haven’t heard yet we have moved. Yes, we are south of the Cities in Rochester, MN, motherhouse of the Franciscan Sisters of Rochester and the famed Mayo Clinic. We moved February 7th, a date none of us will forget. It was in the depths of white winter and bitter cold. I wanted to work on our Blog banner right away but where could I find seasonal photos in this colorless environment. Then I heard about Sr. Elizabeth Gillis who lives here with us and for years has photographed the seasonal landscapes around the Motherhouse. Sr. Elizabeth loaned us her “thumb drive” where among her many beautiful photos we found exactly what we wanted. Kim, here at the Motherhouse and her bright young son, Nick, and Jonya, my new friend at the Rochester public library helped get the photos on to the web. The next quest was where do we find an image of St. Clare. After canvasing the Motherhouse for inages of St. Clare I remembered the statue of Clare that was carved for Mayo Clinic, St. Mary’s Campus, about twelve years ago. Ready to rush right over to St. Mary’s and photograph the carving, I was alerted to the fact that the statue was in storage due to ongoing building projects at St. Marys. Then in a happy turn, Wes Thompson, Facilities Director here at Assisi Heights, directed me to Sr. Lauren Weinandt, longtime archivist at St. Mary’s. In the archives of the famous hospital was the history of the making of this amazing statue of St. Clare with photographs of the day on which Clare’s image was blessed. This next part of the story is personal to me. 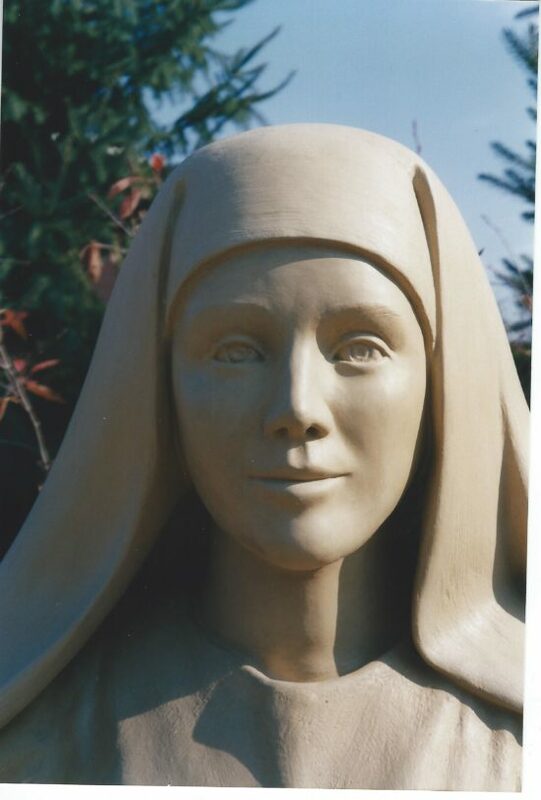 I remembered the visit about 13 years ago of a young woman from St. Paul, MN, who was commissioned to carve a statue of St. Clare for St. Mary’s Peace Garden. We met in one of the parlors in our monastery in Bloomington. One of her questions was about symbols appropriate to St. Clare. I suggested that Clare was known for washing the feet of her Sisters when they returned from their ministry outside the monastery. What I remember most clearly of the encounter is that I took the young woman to our sacristy and showed her the bowls and pitchers crafted by the fine potter, Warren McKensie, of Stillwater, MN, the pottery which we used at the liturgy of the foot washing every Holy Thursday. I think that I showed her the towels also. When I saw the archival photos this all came back to me. The name of the sculptress is Caprice Kueffner Glaser. And here is the Clare she gave us. Sister Caroline Berres took these beautiful photos shortly after Clare was placed in the Peace Garden.